View More In Small Pastry Molds - Page 4. 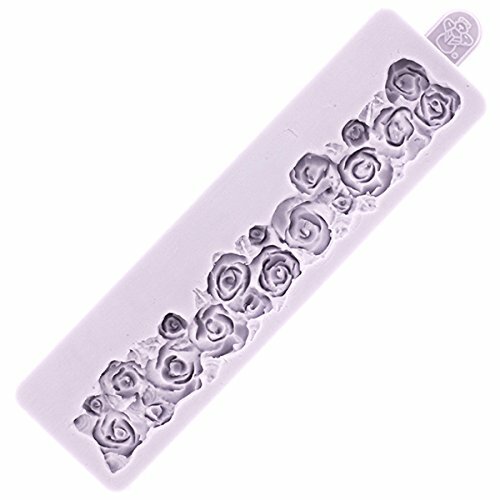 Piped Rose Border Mold by Karen Davies. Mold measures approximately 7 inches long x 1-1/2 inches wide. The mold is made from high quality silicone and will not rip or tear under normal use. Designs can be used together as a border or as separate pieces. All silicone molds are thoroughly inspected before shipping and will not be replaced if damaged in use. Makes cake and cupcake decorating fun and and easy! Food grade silicone. Products release easy from molds. Easy to use with full instructions. Easy to clean, lasts for years. If you have any questions about this product by KAREN DAVIES, contact us by completing and submitting the form below. If you are looking for a specif part number, please include it with your message.